WASHINGTON — President Trump said on Thursday that the United States should recognize Israel’s authority over the Golan Heights, one of the world’s most disputed territories, reversing decades-long American policy and violating a United Nations resolution. The president’s announcement, in a midday Twitter post, serves to recognize Israeli sovereignty over land that its troops seized in war. It came after repeated pressure from Prime Minister Benjamin Netanyahu of Israel, which claimed the Golan Heights from Syria in 1967 and effectively annexed it in 1981. The United Nations Security Council has declared that Israel must withdraw from territory acquired by force. The White House refused to comment or offer clarification on whether Mr. Trump’s statement amounted to actual policy change on the Golan Heights, an area of land in Syria that abuts the borders of Israel, Jordan and Lebanon. Mr. Netanyahu, however, considered it a done deal — and one sure to increase his chances in a bitter race for coming parliamentary elections. Mr. Netanyahu called it “a miracle of Purim,” referring to an ancient Jewish holiday being celebrated this week. He also tweeted a note of thanks to Mr. Trump within minutes of the president’s announcement. Mr. Trump’s announcement is at odds with international law and decades of American policy in the Middle East. The United Nations and the United States have steadfastly refused to recognize Israel’s seizure of the Golan Heights and the West Bank in the Arab-Israeli War of 1967, arguing that the contours of Israel and a new Palestinian state must be negotiated diplomatically. Since then, Israel has treated the territory as part of its country, and the Jewish population has grown with the expansion of Israeli settlements. Syria has often criticized Israel’s settlement of the territory in international forums. The shift from Washington also has profound consequences for the Israeli-Palestinian peace plan being drafted by Mr. Trump’s son-in-law and senior adviser, Jared Kushner, since it will confront Arab leaders with the choice of acquiescing in Israel’s annexation of Arab land. Analysts expressed outrage at Mr. Trump’s statement, saying that it violated the United Nations resolution adopted after the 1967 war and would embolden other leaders who seized territory. Mr. Netanyahu is scheduled to visit Mr. Trump in Washington next week and is expected to speak at the annual conference of the American Israel Public Affairs Committee, a pro-Israel lobbying group that has wide support among American politicians. There have been signs that the Trump administration was moving in this direction. A recent State Department report on human rights issues used the phrase “Israeli-controlled” instead of “Israeli-occupied” to describe the territories of the Golan Heights, the West Bank and Gaza. Before Mr. Trump’s statement, Syria’s ambassador to the United Nations in Geneva, Hussam el-Din Ala, warned against Israel’s “malicious attempts to exploit the situation and the latest developments in Syria and the region to consolidate the occupation” of the Golan Heights, the Syrian state news agency, SANA, said. Mr. Ala spoke during a symposium on the topic on the sidelines of a meeting of the United Nations Human Rights Council. 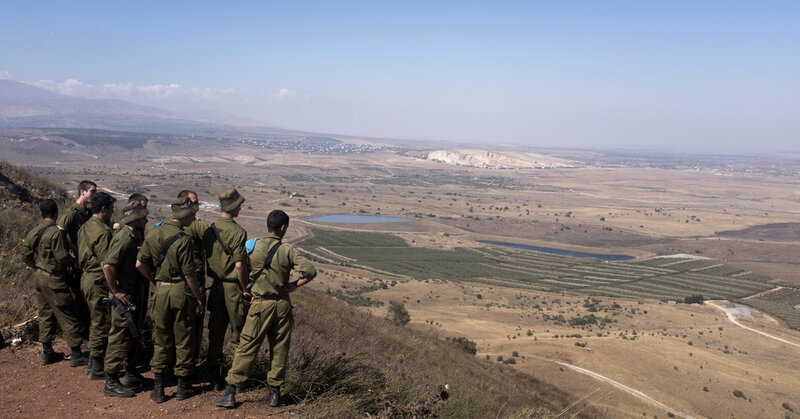 Critics of President Bashar al-Assad of Syria have noted that for as much as he and his government have talked about “liberating” the Golan Heights, they have taken little action to do so in decades. Mr. Pompeo was in Jerusalem as part of a multination visit to the Middle East that will take him next to Lebanon, where he said he would talk to officials in Beirut about the threat posed by Hezbollah, a military group that is a major political player in the government. Lebanon claims a small sliver of territory that Israel occupies and administers as part of the Golan Heights. Many Israeli conservatives approve of Mr. Trump’s policies on Israel. Last year, the Trump administration moved the United States Embassy from Tel Aviv to Jerusalem, recognizing Jerusalem as Israel’s capital. The Trump administration has also cut aid to Palestinian refugees, and late last year, the United States voted against a symbolic United Nations resolution that annually condemns Israel’s presence in the Golan Heights — it was the first time the United States voted against the measure. “Well done, Mr. President!” he wrote in a Twitter post. On March 11, Mr. Graham and David M. Friedman, the American ambassador to Israel, visited Mr. Netanyahu in Jerusalem, where the senator vowed to push for the United States to recognize Israeli sovereignty over the Golan Heights. But the move threatened to roil the Middle East — and American allies with interests there. April 18, 2019 Comments Off on Tacos. Tequila. Telenovelas. Nairobi Embraces Its Mexican Soul.